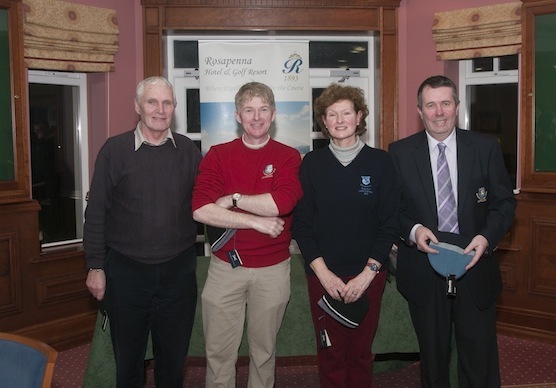 Runners up were Clare Lenny, Mick Gallagher Jnr, Jodie Mc Hugh and Seimi McBride with 56 3/4. 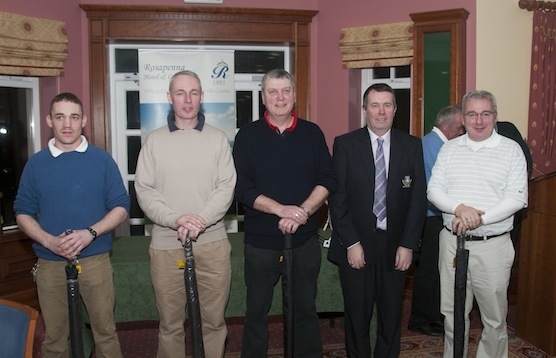 Third place was the team of Diane Barnett, Paddy McClafferty, Edward McGroddy and Mick Gallagher Snr with 57 3/4. There was a huge turnout on the day and thank you to the committee involved in organising the open draw. Both Diane & Eddie would like to thank all the members who played in the scramble and all those that wished them well on the day. 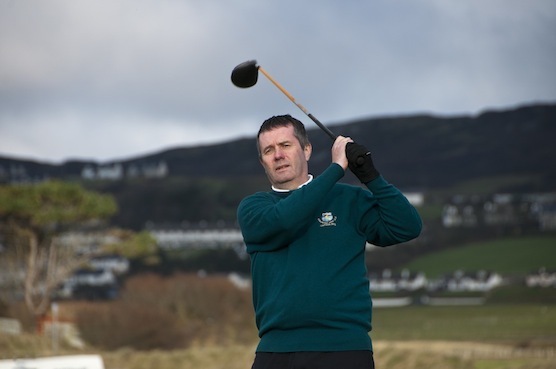 The Sunday singles stroke competition on the 12th of Feb was played over the Sandy Hills Links and was won by Denis McBride with 69 nett bot. 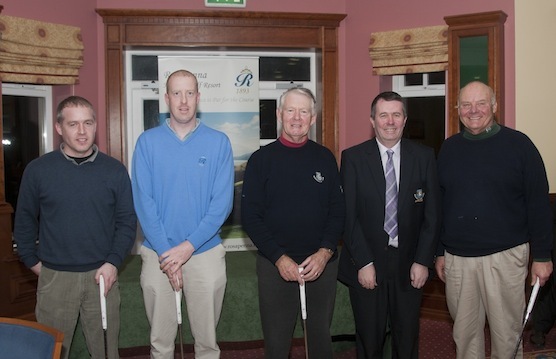 Runner up was Shane Doherty 69 nett. Gross winner was Shaun Boyce with 81 bot. Third place was Denis Boyce with 71 nett. 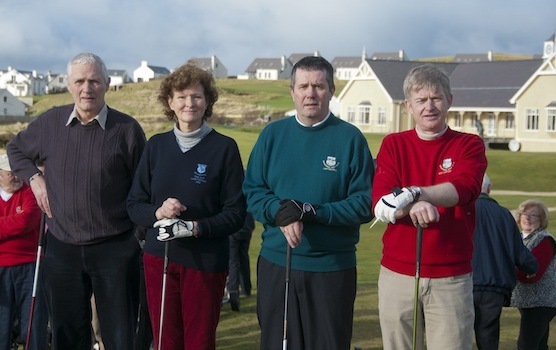 The Mevagh Day Centre Fund Raising Golf Classic will take place over the Sandy Hills Links on Saturday the 25th of February. The entry fee is 120e per team of four. Contact Charlie McBride on 087-947-2260 for entries. If your golf ball lands on the fairway you must lift it and place it in the semi rough on either side. A ball in the semi-rough or rough must be played as it lies. Only a putter may be used on the fairway. From Monday the 20th – Friday the 24th the Sandy Hills Links will be closed and the Valley Nine only will be in play from winter tees to temporary greens. The side of the fairways rule will also remain in place. The Sandy Hills Links will be open on Sat 25th & Sun 26th of Feb.
All members are kindly asked to keep all pull trolleys, electric trolleys and drive buggies well back from the roped off putting green surrounds and all teeing areas on all golf holes as we try to protect the main playing surfaces as much as possible over the winter months. All players are asked to play from the mats provided on the Par 3’s and not from the turf teeing area directly behind or alongside the mats. All of the clearly marked areas on holes 1, 8, 9 and 13 on the Sandy Hills Links that are currently under construction are ground under repair.